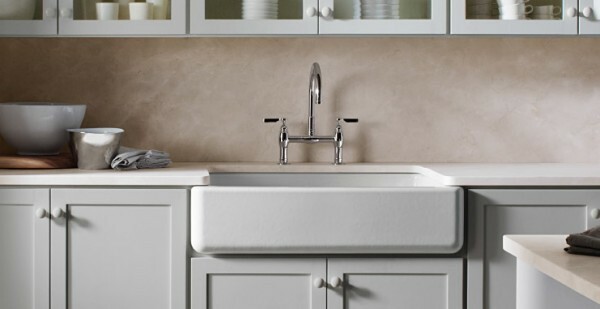 There’s something about apron-front sinks that hearkens back to a simpler era. These utilitarian fixtures reflect a hard-working history as everything from canning work spaces to washbasins for dogs and small children. No wonder they've long been an iconic element in traditional-style kitchens. They’re becoming increasingly popular in contemporary spaces, too, thanks to fresh twists on colors and materials and easier installation options. 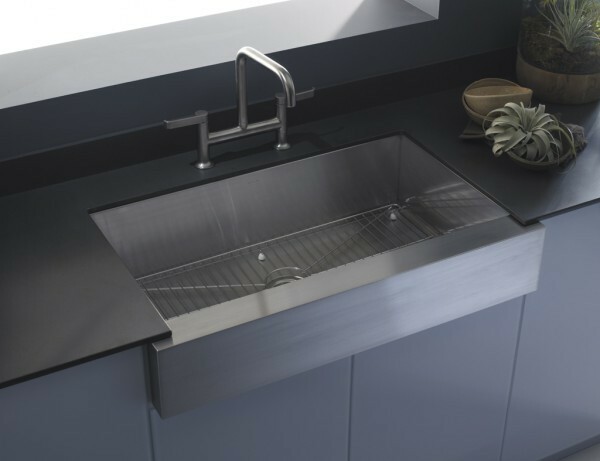 One of the keys to apron-front sinks’ popularity is their unique combination of beauty and functionality. Available with a wide single-bowl or a double-bowl with a lower divider, apron-front sinks are large enough to accommodate oversized cookware and cookie sheets, and their distinctive form creates a stunning focal point in the kitchen. 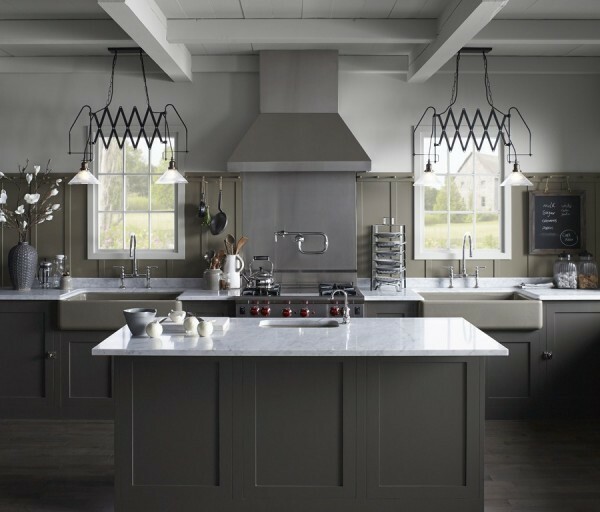 The Whitehaven Hayridge sink takes the apron-front sink in a decidedly artful direction, with its distinctive pattern of horizontal ridges that adds a tactile quality. Apron-front sinks are also ergonomically friendly. Often oriented farther forward than typical drop-in or under-mount sinks, they let you get closer and work with less stress and strain. 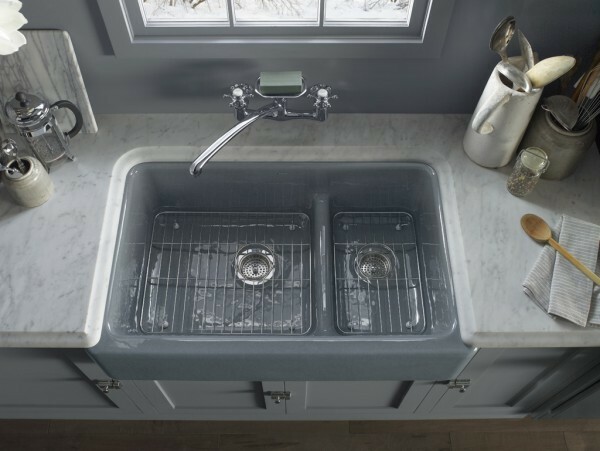 The classic deep bowl of the apron-front sink also means less splashing and fewer puddles on surrounding surfaces. Along with the kitchen, the farmhouse sink has undergone some evolutionary changes of its own. Fresh shapes, new colors and decorative designs coordinate with an unprecedented array of styles. When it comes to materials, enameled cast iron remains popular for its beauty, strength and durability. KOHLER enameled cast iron sinks are guaranteed not to chip, crack or burn--and they’re available in an expanded range of color, pattern and shape options. To complement modern kitchens, Vault™ stainless steel sinks create a look that cleverly straddles the traditional apron-front and contemporary stainless designs. 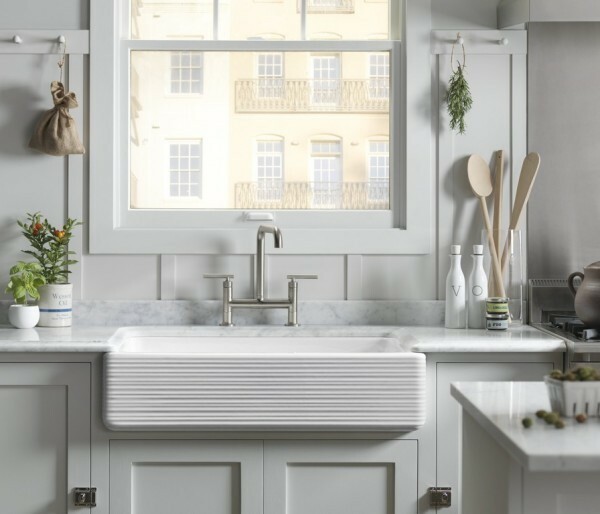 Another innovation: Kohler’s easy-to-install Self-Trimming® design, available on the Whitehaven® and Vault kitchen sinks, makes the iconic apron-front more accessible to homeowners than ever before. The idea of including a farmhouse-style sink in a modern space may seem odd at first. But thanks to their clean lines and iconic forms, these classic sinks work beautifully in both traditional and contemporary kitchens. In contrast to sinks that are designed to be more discreet by integrating into countertops, apron-front sinks have an unabashed presence that makes them a great centerpiece in the kitchen. “An apron-front sink deserves to be the star of the show,” says Milwaukee interior designer Marianne Kohlmann. “So you shouldn’t have a supporting cast—other appliances, fixtures and design elements—drawing too much focus away from it.” But apron-front sinks do, in fact, allow one other star in the kitchen: water. They celebrate its presentation in much the same way that a central fountain in a park provides a serene axis for the busy life that revolves around it.